Manufacturer improves production processes and maintains annual growth of 20 percent. Company’s inventory count is improved more than threefold with better tracking and inventory management functions. Easy access to real-time data reduces the time to prepare shipping reports. Plex replaced Monitor ERP system. Headquartered in Shelby Township, Michigan, Avon Machining manufactures precision-machined components and subassemblies for heavy industrial equipment manufacturers. Since its beginnings in 1974, the company has experienced steady growth. In the last 10 years, the company saw an average annual growth rate of 20 percent, particularly impressive given the economic downturn in the manufacturing industry. In an ongoing effort to make processes and operations more efficient, Avon Machining decided to implement an enterprise resource planning (ERP) system, called MONITOR ERP System, to integrate data from several disparate sources. Before deploying the ERP system, all of Avon Machining’s departments, including engineering, production, quality and accounting, had their own Access databases and Excel spreadsheets. The databases were not integrated with each other, which made tracking, retrieving and communicating critical data very difficult and time-consuming. Avon Machining Company’s initial ERP solution did not effectively integrate information or make it easily accessible. Only a handful of people in the company could make changes and look up real-time inventory information. This contributed to errors in data entry, tracking and status reporting. The company needed a solution that could seamlessly integrate across the enterprise and provide easier access to real-time information. After reviewing and testing several options, they decided to implement ERP from the Plex Manufacturing Cloud. Avon Machining made this choice based on the solution’s ability to meet its requirements, its reputation in the industry and its ability to connect and manage all areas of the manufacturing operations. Comprehensive, accurate and timely information is needed for efficient management of costs and resources. 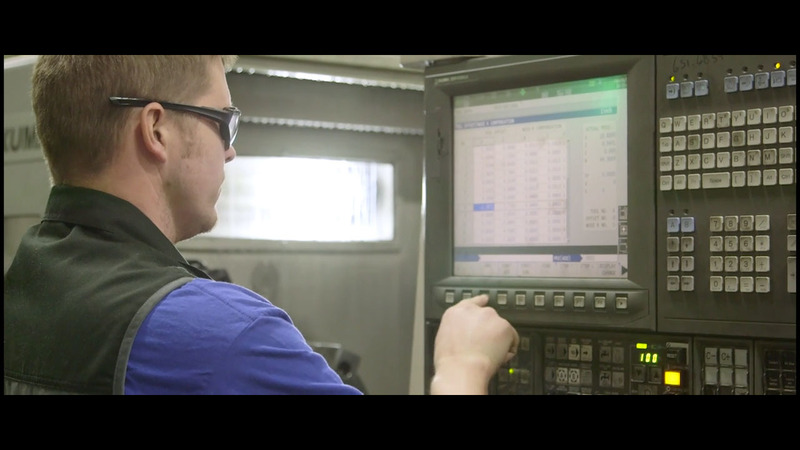 At Avon Machining, the previous ERP solution couldn’t generate detailed data such as the cost, production time and quantity of parts produced in each of the various workcenters on the shop floor. Plex Cloud ERP tracks and records all physical events such as production, inventory status changes, receiving, subcontracting, shipping, and other data on the shop floor. This ability to generate in-depth information in real time has made tracking activities and costs easy. Employees are able to log in individually at their workcenters and record production details in real time. For example, if an employee makes five parts in one hour, he or she logs that detail at the end of the hour. Before Plex, they recorded total production at the end of the day. There was no way to know the number of parts produced per hour, number of discrepant parts, number of parts that were reworked or related production costs. In addition to tracking, employees are now able to identify and label defective parts earlier and send them for correction before they move farther along the manufacturing process. “This enables our employees to better focus on daily production, saving time and reducing errors,” explained Korth. Avon Machining outsources some production parts to smaller local companies. Previously, if there was an issue with a part sent by the supplier, tracking the part to the supplier for rework purposes was a time-consuming chore. It was challenging to know the status of the rework without a great deal of effort. Discover how manufacturers can select the correct metrics approach that aligns to their business processes . Learn how the ERP software solutions from Plex can help you improve your strategy. See how leading manufacturers maximize their ERP investment, resulting in business benefits.